Shortly before his death, Carl Fisher liked to walk along the shoreline in Miami Beach, Florida and think about the long journey that brought him there. It is the story of a true American original. 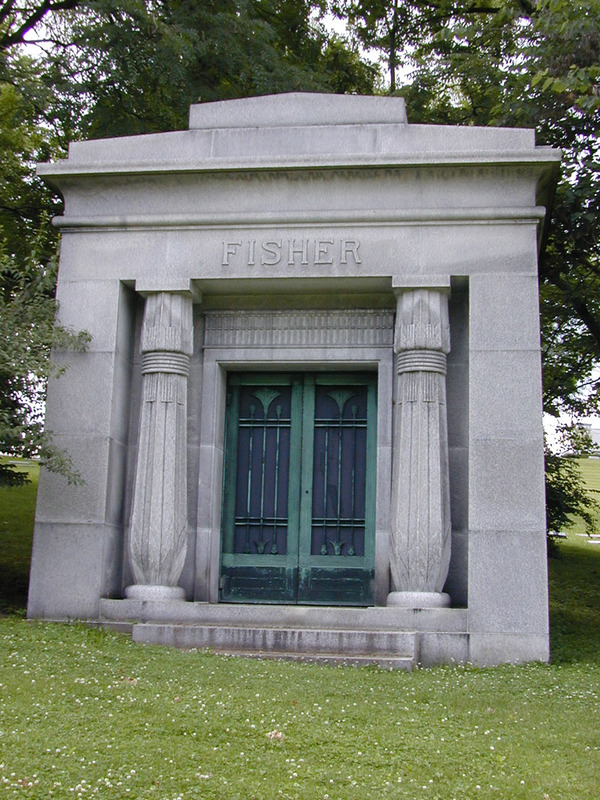 Fisher was born on January 12, 1874 in Greensburg, Indiana. It was difficult for Carl to pay attention in school because of a severe astigmatism, and he dropped out in 1886. He held a couple of jobs, including working as a newspaper and cigar salesman on trains in and out of Indianapolis. About that time a bicycle craze started to sweep America, and the enterprising Carl opened a very successful bicycle repair shop along with his brothers in 1891. To promote his shop he started creating promotional stunts, which included a tightrope walk over Washington street (in a padded suit, of course). As the bicycle craze died down around 1900, another took its place – the automobile. Frequently owners of bicycle shops built these new devices, and Fisher’s was no exception. He went into partnership with his friend, Barney Oldfield and opened what was probably the very first auto dealership in America. Fisher began promoting the Packard, Reo, Stutz and Oldsmobile brands in the same way – at one point pushing a car off a building, starting it up, and driving it off to prove its durability. Another time he actually strapped a car to a hot air balloon and flew it over the city – and then seemingly drove it back into town to mobs of cheering crowds. He later revealed that he removed the engine to make the car light enough, and drove a different, pre-planted car back into town. 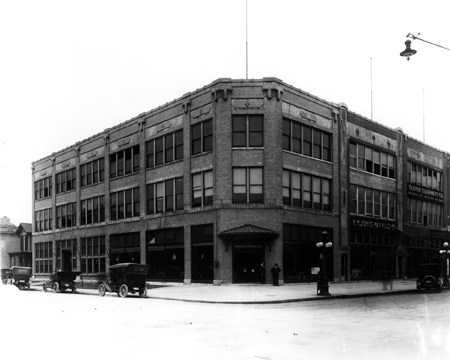 The Fisher Automobile Company at 400 North Capital in 1914. Photos from the W. H. Bass Photo Company Collection, Indiana Historical Society. 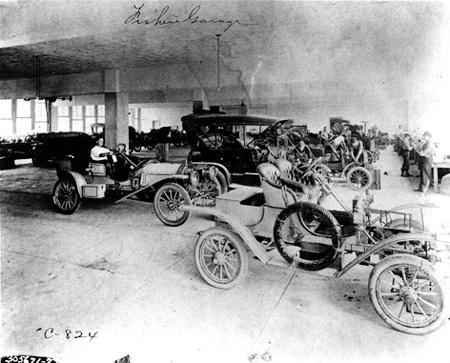 This was most likely the first automobile “dealership” in the world – he carried Oldsmobiles, Reos, Packards, Stoddard-Daytons and other brands. 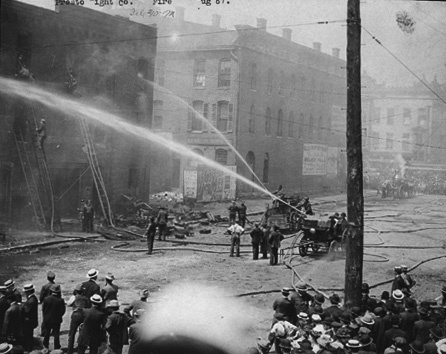 The Prest-O-Lite factory at 211 East South Street in Indianapolis burns in 1907. The explosion also blew up a sauerkraut plant nearby, spraying wet kraut all over the block. The city passed an ordinance forbidding the filling of the gas canisters within city limits, so Fisher built a giant new plant in what would become Speedway, Indiana. Photo from the W. H. Bass Photo Company Collection (9490), courtesy Indiana Historical Society. 1904 was a watershed year for Fisher. The owner of a patent for a sealed, gas-filled automobile headlamp approached him and convinced to market the device. This was the first practical sealed beam headlight – before that time, gas flames and even candles were employed as methods for seeing at night, as the bumpy roads would not allow the fragile filament of an Edison-style lamp to survive. Fisher brought in James Allison, his friend from the days of racing bicycles built in his shop, and they named the company “Prest-O-Lite”. Soon Fisher’s firm supplied nearly every headlamp used on an automobile, which made him millions and friends with all the great auto magnates of the time. He built plants all over the country to supply the demand. Unfortunately, the gas that filled the lamps was highly explosive, which meant that Prest-O-Lite’s factories often caught fire. In 1911, Union Carbide company bought Prest-O-Lite for the then-unbelievable sum of $9 million. 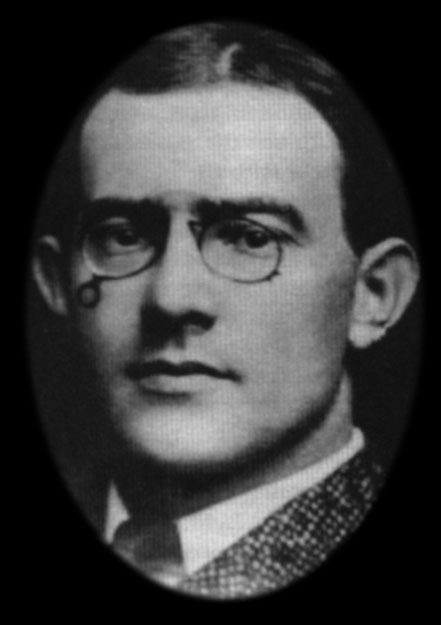 In 1912, Fisher and Allison used some of their fortune to back a young Purdue University graduate named John Esterline who had devised a reliable electrical starter system. Ironically, the widespread use of this starter would make an on-board electrical system standard on most cars, which in turn put their former company, Prest-O-Lite, out of business. Later another use was found for the gas canisters – as power for welding torches – which you can still buy to this day. In 1909 Fisher and Allison joined with another bicycling friend, Arthur Newby and a fourth person, Frank Wheeler, in each putting up $250,000 to create a proving ground for automobiles in Indianapolis. At the time Indiana was the heart of the automotive industry, with more companies based in Indiana than in Michigan. They created a 2 and 1/2 mile track, paved it with crushed stone and called it the Indianapolis Motor Speedway. The first race at the track was actually a motorcycle race, which wasn’t too well received. The first automobile race, held on August 19th, 1909 was deadly – six people died, including 2 spectators – and officials ended the race early. Convinced the crushed stone was the problem, Fisher convinced Newby to pay for 3.2 million paving bricks laid down over the next year and a half. This would create a new, durable, relatively smooth surface – one that allowed the first 500-mile race to take place on Memorial Day, 1911. The track is still called “The Brickyard”, and a one-yard strip of the original brick forms the start/finish line of the track today. 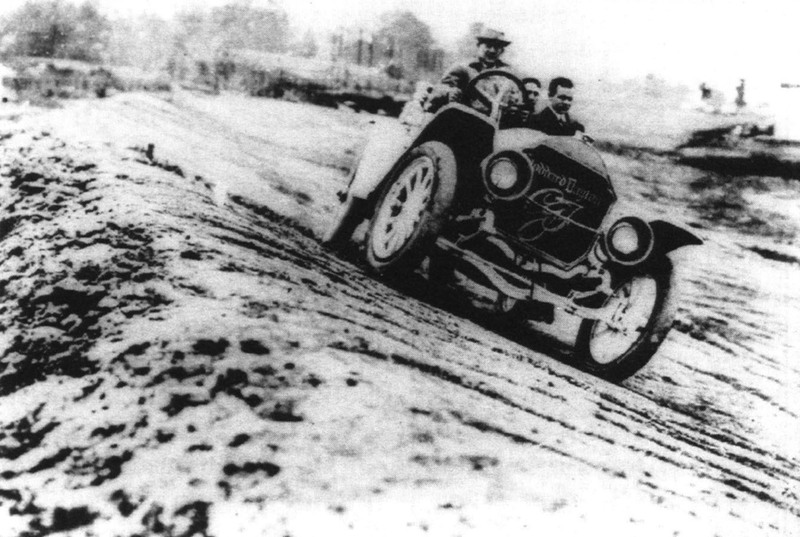 Fisher pilots his Stoddard-Dayton during the first trip around the newly built track in 1909. Photo courtesy Indianapolis Motor Speedway. As with the track, Carl would again prove himself a master at convincing others to pay for his ideas. Fisher recognized that the poor road system in America would soon hamper the growth of his automobile industry. He wrote, “The highways of America are built chiefly of politics, whereas the proper material is crushed rock or concrete”. On September 1, 1912 at a dinner party for automobile manufacturers, he unveiled his idea for a coast-to-coast road from New York City to California. In July of the following year, he created the Lincoln Highway Association, and announced the highway’s route in August 1913. As work began, Fisher took a vacation in Miami, Florida. He looked over a swampy, bug-infested stretch of land, and in his mind transformed it into the perfect vacation destination for his automobile industry friends – he called it “Miami Beach”. In order to get there, however, he had to appeal to the governor of Indiana to set up another highway – this time one that would run from Chicago to Miami. On April 3, 1915 in Chattanooga, Tennessee, the “Dixie Highway” project was born, and just over one year later the road was open from Indy all the way to Florida. As the economy boomed, so did Carl’s playground in Florida, growing at some 440% from 1920 to 1925. In 1925 at the height of the boom, newspapers estimated Carl’s wealth at $100 million. Unfortunately, in 1926 the end began for Carl as he divorced his wife, Jane. About this same time the press began to cover stories about shady land deals that had sprung up around Miami Beach, the proverbial “if you believe that, I have some swampland in Florida to sell you” stories. Carl had also started to develop what he called “the Miami Beach of the north” – at Montauk on the eastern tip of Long Island. In September a hurricane struck and nearly wiped out Miami Beach, killing 113 people. Tourism dropped in 1927. The last blow came in 1929 with the stock market crash – there was no longer a market for high-priced vacation homes, Montauk flopped, and Carl’s fortune was lost with so many others. He sold even his own house in Miami Beach. His former partners in the Miami Beach development gave him a salaried position as a publicist and promoter. Carl began to drink heavily, and by 1938 had cirrhosis of the liver. The man Will Rogers said had done “more unique things even before I heard of Florida than any man I ever met” died on July 15, 1939. He had only $52,198 to his name according to an article in the Miami Herald the next day. His family had him cremated, and the urn stayed in Miami until 1943, when they moved it to the family mausoleum at Crown Hill, though not in the space originally reserved for him. On September 22, 1918, a Captain Robert Hammond of the British Royal Flying Corps crashed during a war bond celebration at the Speedway. Since the family lived in England, Carl temporarily donated his place in the mausoleum until they could come and claim the body. They never did, and to this day, Captain Hammond is in Carl’s original place in the building. Can you please tell me when this article was published and who the author is? It was published in July of 2014 and I am the author.